Neutral taupe linen-like fabric envelopes the Inga Dining Chair. Match this chair to your existing décor and watch it add a bit of modern style to your setting. Sturdy, solid beechwood legs are available in a walnut or coffee finish to help complement your space. The Inga Dining Chair is the perfect balance of style and comfort. I am so pleased with the Inga dining chairs. I ordered six of them to replace my highback dining chairs which makes my small dining room larger and airy. So glad I took a chance and ordered online. The only advice, use a better Allen wrench to assemble the chairs. More cushioning than I expected and I am pleasantly surprised!! Nice to be sitting on something more comfortable when dining - looking forward to having company over! Fabric was almost precise but still a tad off especially under the yellowish hue lighting in my dining room. They match nicely nonetheless and I'm happy i purchased them. Customer service suggested requesting color swatches for future orders. Arrival time was accurate and assembly was simple. Good chairs for a traditional setting transitioning to contemporary surprised to find them on a modern furniture site! These chairs came in handy when I needed them to ship fast and work well with a dining room design I only had a few details about without seeing it in person beforehand - they went amazingly well!! It was a nice surprise! This place is a great and customer service was super helpful! I like how the seat hangs off the edge a little on the frame, it provides a lot of support and comfort but gives even more stability and balance to the design, great chair!! Linen fabric was softer and more comfortable than i imagined it would be - everything arrived on time and I am very happy with my order! Great to be able to redesign my parents house who have a more traditional style but sort of needed a upgrade to their space - they seem to like them, if they are happy I am happy! I was looking for chairs with that old-school , vintage look to them, judging from the photos i thought they would be a good fit and it turns out I was right! They look awesome, exactly the vibe I was going for, thank you for the timely delivery too! Very pleased with the chairs, I purchased four. These chairs have a nice seat depth, attractive and comfortable fabric, and I am very pleased with the black wood on the frame which is matte finish. Very nice for the price. a modern meets vintage look to it, great! thank you! I ordered 4 for my dining room, the cushioning is soft and comfortable, the quality feels like its built to last, thank you inmod! Perfectly fit with my vintage mid century modern table for $99 each. Walnut is great color match. ProsLower Cost, full back and seat cushions, strong wood base. ConsDirections not nearly helpful enough to put this chair together without making mistakes. Only diagrams used. Words should be added. Be sure to push the chair cushion firmly toward the back of the chair when screwing into the seat or u will have a gap at the juncture. Very hard to put together with the tiny Allen wrench but I still like them. Don't forget to buy additional screw on glides, as no glides included. Scotch guard application to the fabric is next on my to do list. Purchased 6 after getting in our new dining room table, very happy with the coffee finish, went with our choice of table beautifully. I love these chairs!!! The upholstery is so gorgeous. The chairs are really comfortable and at a great price point. They shipped quickly and arrived in great condition. ProsBeautiful upholstery and very comfortable. My husband is 250 pounds. Will this support him? The Inga Dining Chair is rated for use of up to 250 lbs. IS the fabric more on the grayish or brownish side? 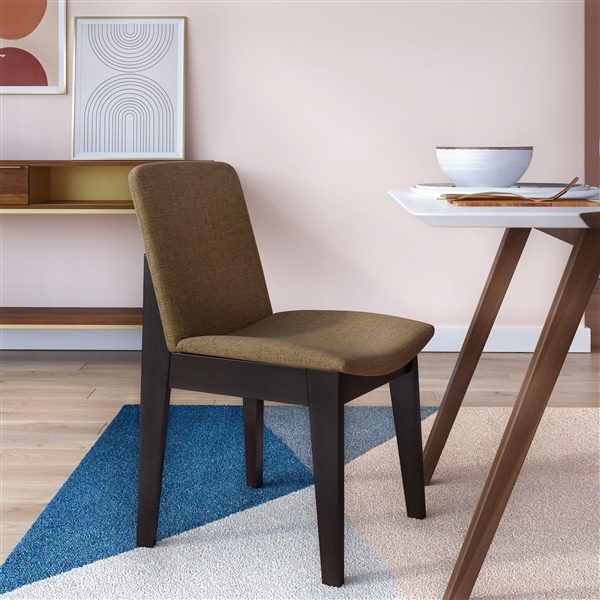 The Inga Dining Chair is upholstered in a Taupe fabric, which is going to be a blend of grey and brown. Does this chair have any fabric protection on it? What is the fabric content of these chairs. The fabric content is polyester. There is no fire retardant or stain protectant on the material.